Thinking about visiting Los Angeles? 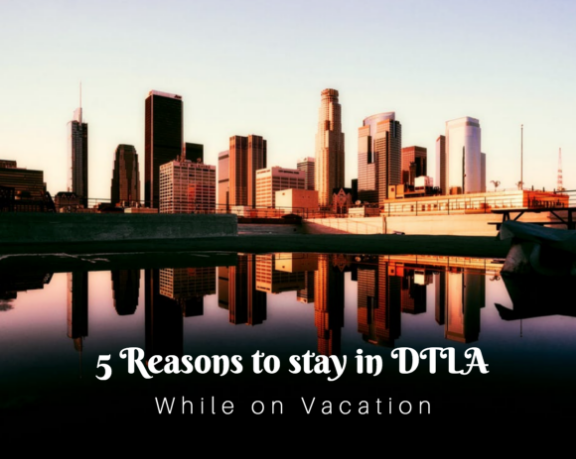 One of the best places to stay in Los Angeles for vacation is downtown L.A. Stay at the best DTLA hotels and discover these five reasons why you should stay here for your vacation. Want something new and different? Head to Bestia, a trendy Italian restaurant serving up seasonal cuisines. Here, you’ll be treated to exquisite charcuterie, delicious pasta and fantastic cocktails. Don’t want something as hearty as Italian food? If you don’t have a ton of time, stop by the Fresh 8 Snack Bar. It’s a great place to relax and unwind while you sip on a beer or grab a small bite to eat such as a salad, sandwich or other snacks like a protein shake! With over 50 selections, you’ll find something just for you. Fresh eight is located within the LAAC Hotel. L.A. Live is the entertainment destination of Los Angeles. Situated near the Staples Center and the LA Convention Center, there are also fun things to do such as visiting restaurants or catching a movie at the Regal L.A. Live cinema. Additionally, there are events here such as the R&B Rewind Fest ft. Boyz II Men, and more! Meanwhile, over at the Staples Center, the venue hosts sports such as hockey and basketball games to concerts such as Taylor Swift and Justin Bieber. The Broad has quickly become one of the favorite modern art museums to the locals, and with good reason. The museum offers impressive art pieces from paintings and pictures to sculptures and large pieces. Additionally, admission is always FREE so be sure to reserve your tickets online in advance. Over at the Chinese American Museum, you can enjoy new forms of art that you may not be used to. Learn about the history of early Chinese Americans and see their essential forms of art. Did you know that the Los Angeles Athletic Club was the city’s first club? It’s been around since 1880, and at the time, only 11,000 people were living in the city. Before that, Spanish explorers traveled through the area, and the first mission was established in 1771. You can still see the mission in nearby San Gabriel. Visit Olvera Street in downtown to explore the city’s Mexican roots then head over to the nearby Union Station that was opened in 1939 and has unique 20s era architecture. Downtown L.A. puts you in the middle of all the action. Close to popular attractions and destinations, there’s no reason to go anywhere else. But if you do want to explore, no worries because DTLA is also conveniently located to all the freeways so you can quickly get to wherever you want to go!